The Sterling Strategy 2014+ is a compelling vision for the future of The Sterling Hall School. This strategy was launched in September 2014. We are truly excited by the positive impact that this guiding vision has had and will continue to have on our school, our community and, most importantly, the educational experience for each Sterling Hall boy. Please click the image below for the full publication. The following excerpts are taken from a letter written by Principal Rick Parsons identifying our niche and introducing our Sterling Strategy 2014+ with our mission, core values and vision for The Sterling Hall School. The values of learning, character and community are closely interconnected, especially in elementary schools. The dynamic interplay between these three core values creates a magical experience for our boys. By way of example, our warm and supportive community culture fosters positive, trusting relationships. These relationships encourage healthy development of character traits, such as self-confidence, which in turn empower boys to take risks and extend their academic capacities beyond their own expectations. The addition of rigorous, boy-friendly programs and practices that inspire student engagement and collaborative learning promote healthy learning environments, strong relationships and an enhanced sense of community. Thus, there is a symbiotic relationship between these important aspects of school. 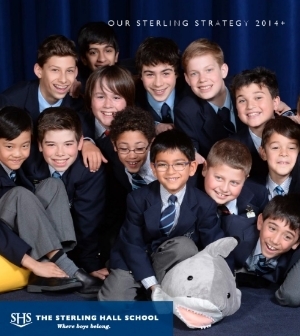 Sterling Hall provides a unique experience whereby boys are empowered to belong, inspired to demonstrate high moral and performance character and challenged to conquer new and creative academic learning, all within a boy-friendly culture. We have a very specific niche. We are a school for boys from JK-8. We are not distracted by the competing educational foci, programs, facilities and financial priorities associated with educating and graduating secondary school students. Nor do we manage the needs of a co-educational environment. We concentrate all of our attention, professional development, research, innovation and program and facility development on boys in the JK-8 years. Delivering the best education for boys in their formative years is our singular focus and, if done right, there is no one who can compete with that. We are a small school. Unlike many large organizations or educational institutions, we are nimble. Collaboration is easier, communication is better and accountability is clearer. Our small size ensures that each boy is known here by many adults. Boys and their families build strong relationships with one another, with teachers and with the school. We are a close community and share a deep sense of belonging. Research tells us boys are relational learners and, during these formative years, small schools provide the ideal environment for boys to learn who they are and who they will become, within the confines of a safe and nurturing community that knows and supports them. We are setting our sights high and striving for excellence. We are on a trajectory to build the top academic elementary school for boys, not only in the GTA, but also in the country. To do this, we need to look beyond our city and beyond our borders, to learn from the best schools in the world. This is a bold vision. Having witnessed the strength of the academic program already in place at Sterling Hall, the dedication of our faculty and staff and our plans for the coming years, I know it is achievable. Many projects in the areas of Sterling Learning, Sterling Community and Sterling Character, underway since September 2012, are propelling us towards our vision. I will endeavor to share more such developments with the broader community in the days ahead.